Card Text Action: Purge a friendly Human creature from play. If you do, play a creature from your discard pile. If a Human creature is purged by Sacrificial Altar, does its “Destroyed:” ability trigger? No. “Purge” and “destroy” are two different methods of card removal. Therefore, since Sacrificial Altar only purges the creature, “Destroyed:” abilities do not trigger. If I use Sacrificial Altar’s “Action:” ability to play a creature from my discard pile, does this trigger any “Play:” abilities for said creature? Yes. If an ability “plays” a card (whether it be from a hand or another location), “Play:” abilities on that played card will be triggered. 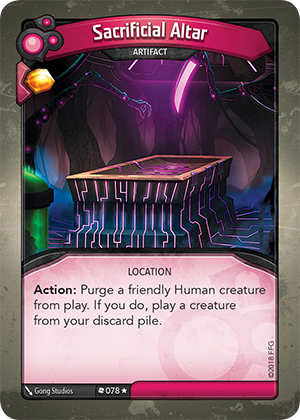 Therefore, since Sacrificial Altar is playing a card from your discard pile (not “putting it into play”), “Play:” abilities will trigger as normal.